The phenomenon behind the Raspberry Pi computer series has been pretty amazing. It's obvious why it has become so popular for Linux projects—it's a low-cost computer that's actually quite capable for the price, and the GPIO pins allow you to use it in a number of electronics projects such that it starts to cross over into Arduino territory in some cases. Its overall popularity has spawned many different add-ons and accessories, not to mention step-by-step guides on how to use the platform. I've personally written about Raspberry Pis often in this space, and in my own home, I use one to control a beer fermentation fridge, one as my media PC, one to control my 3D printer and one as a handheld gaming device. The popularity of the Raspberry Pi also has spawned competition, and there are all kinds of other small, low-cost, Linux-powered Raspberry Pi-like computers for sale—many of which even go so far as to add "Pi" to their names. These computers aren't just clones, however. Although some share a similar form factor to the Raspberry Pi, and many also copy the GPIO pinouts, in many cases, these other computers offer features unavailable in a traditional Raspberry Pi. Some boards offer SATA, Wi-Fi or Gigabit networking; others offer USB3, and still others offer higher-performance CPUs or more RAM. When you are choosing a low-power computer for a project or as a home server, it pays to be aware of these Raspberry Pi alternatives, as in many cases, they will perform much better. So in this article, I discuss some alternatives to Raspberry Pis that I've used personally, their pros and cons, and then provide some examples of where they work best. I've mentioned the Banana Pi before in past articles (see "Papa's Got a Brand New NAS" in the September 2016 issue and "Banana Backups" in the September 2017 issue), and it's a great choice when you want a board with a similar form factor, similar CPU and RAM specs, and a similar price (~$30) to a Raspberry Pi but need faster I/O. The Raspberry Pi product line is used for a lot of home server projects, but it limits you to 10/100 networking and a USB2 port for additional storage. 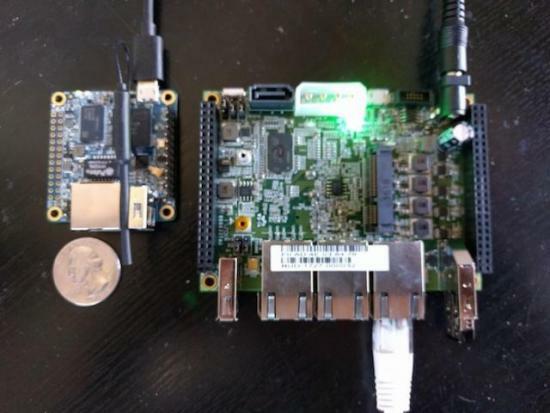 Where the Banana Pi product line really shines is in the fact that it includes both a Gigabit network port and SATA port, while still having similar GPIO expansion options and running around the same price as a Raspberry Pi. Before I settled on an Odroid XU4 for my home NAS (more on that later), I first experimented with a cluster of Banana Pis. The idea was to attach a SATA disk to each Banana Pi and use software like Ceph or GlusterFS to create a storage cluster shared over the network. Even though any individual Banana Pi wasn't necessarily that fast, considering how cheap they are in aggregate, they should be able to perform reasonably well and allow you to expand your storage by adding another disk and another Banana Pi. In the end, I decided to go a more traditional and simpler route with a single server and software RAID, and now I use one Banana Pi as an image gallery server. I attached a 2.5" laptop SATA drive to the other and use it as a local backup server running BackupPC. It's a nice solution that takes up almost no space and little power to run. I was really excited when I first heard about the Raspberry Pi Zero project. I couldn't believe there was such a capable little computer for only $5, and I started imagining all of the cool projects I could use one for around the house. That initial excitement was dampened a bit by the fact that they sold out quickly, and just about every vendor settled into the same pattern: put standalone Raspberry Pi Zeros on backorder but have special $20 starter kits in stock that include various adapter cables, a micro SD card and a plastic case that I didn't need. More than a year after the release, the situation still remains largely the same. Although I did get one Pi Zero and used it for a cool Adafruit "Pi Grrl Zero" gaming project, I had to put the rest of my ideas on hold, because they just never seemed to be in stock when I wanted them. The Orange Pi Zero was created by the same company that makes the entire line of Orange Pi computers that compete with the Raspberry Pi. The main thing that makes the Orange Pi Zero shine in my mind is that they have a small, square form factor that is wider than a Raspberry Pi Zero but not as long. It also includes a Wi-Fi card like the more expensive Raspberry Pi Zero W, and it runs between $6 and $9, depending on whether you opt for 256MB of RAM or 512MB of RAM. More important, they are generally in stock, so there's no need to sit on a backorder list when you have a fun project in mind. The Orange Pi Zero boards themselves are pretty capable. Out of the box, they include a quad-core ARM CPU, Wi-Fi (as I mentioned before), along with a 10/100 network port and USB2. They also include Raspberry-Pi-compatible GPIO pins, but even more interesting is that there is a $9 "NAS" expansion board for it that mounts to its 13-pin header and provides extra USB2 ports, a SATA and mSATA port, along with an IR and audio and video ports, which makes it about as capable as a more expensive Banana Pi board. Even without the expansion board, this would make a nice computer you could sit anywhere within range of your Wi-Fi and run any number of services. The main downside is you are limited to composite video, so this isn't the best choice for gaming or video-based projects. Although Orange Pi Zeros are capable boards in their own right, what makes them particularly enticing to me is that they are actually available when you want them, unlike some of the other sub-$10 boards out there. There's nothing worse than having a cool idea for a cheap home project and then having to wait for a board to come off backorder. When I was looking to replace my rack-mounted NAS at home, I first looked at all of the Raspberry Pi options, including Banana Pi and other alternatives, but none of them seemed to have quite enough horsepower for my needs. I needed a machine that not only offered Gigabit networking to act as a NAS, but one that had high-speed disk I/O as well. The Odroid XU4 fit the bill with its eight-core ARM CPU, 2GB RAM, Gigabit network and USB3 ports. Although it was around $75 (almost twice the price of a Raspberry Pi), it was a much more capable computer all while being small and low-power. The entire Odroid product line is a good one to consider if you want a low-power home server but need more resources than a traditional Raspberry Pi can offer and are willing to spend a little bit extra for the privilege. In addition to a NAS, the Odroid XU4, with its more powerful CPU and extra RAM, is a good all-around server for the home. The USB3 port means you have a lot of storage options should you need them. Although the Odroid XU4 is a great home server, I still sometimes can see that it gets bogged down in disk and network I/O compared to a traditional higher-powered server. Some of this might be due to the chips that were selected for the board, and perhaps some of it has to do with the fact that I'm using both disk encryption and software RAID over USB3. In either case, I started looking for another option to help take a bit of the storage burden off this server, and I came across the Espressobin board. The Espressobin is a $50 board that launched as a popular Indiegogo campaign and is now a shipping product that you can pick up in a number of places, including Amazon. Although it costs a bit more than a Raspberry Pi 3, it includes a 64-bit dual-core ARM Cortex A53 at 1.2GHz, 1–2Gb of RAM (depending on the configuration), three Gigabit network ports with a built-in switch, a SATA port, a USB3 port, a mini-PCIe port, plus a number of other options, including two sets of GPIO headers and a nice built-in serial console running on the micro-USB port. The main benefit to the Espressobin is the fact that it was designed by Marvell with chips that actually can use all of the bandwidth that the board touts. In some other boards, often you'll find a SATA2 port that's hanging off a USB2 interface or other architectural hacks that, although they will let you connect a SATA disk or Gigabit networking port, it doesn't mean you'll get the full bandwidth the spec claims. Although I intend to have my own Espressobin take over home NAS duties, it also would make a great home gateway router, general-purpose server or even a Wi-Fi access point, provided you added the right Wi-Fi card. A whole world of alternatives to Raspberry Pis exists—this list covers only some of the ones I've used myself. I hope it has encouraged you to think twice before you default to a Raspberry Pi for your next project. Although there's certainly nothing wrong with Raspberry Pis, there are several small computers that run Linux well and, in many cases, offer better hardware or other expansion options beyond the capabilities of a Raspberry Pi for a similar price.